BRADENTON, Fla. (AP) -- Florida State wrapped up four days of training camp at IMG Academy with coach Willie Taggart saying the Seminoles accomplished several things as they prepare for their season opener against Virginia Tech. What Taggart wasn't ready to announce, though, is his starting quarterback. Redshirt junior Deondre Francois, sophomore James Blackman and redshirt freshman Bailey Hockman are competing for the job. All three have been taking snaps with the first team during camp. Taggart said he's looking for playmaking and leadership from whoever wins the job. 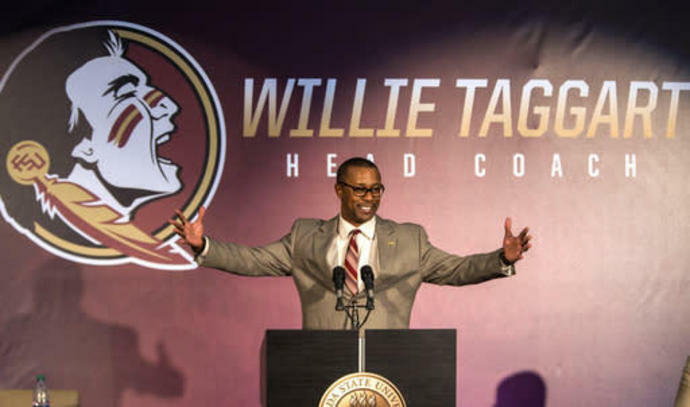 ''Part of it is getting the ball to the right guys, some of it is just building them up and encouraging them to do the things they are supposed to and being that leader of the entire football team,'' Taggart said. Taggart said the trip also helped build chemistry within the team. The Seminoles, who signed a multi-year agreement to host a portion of preseason camp at IMG. headed back to Tallahassee after Thursday's practice. Meanwhile, Taggart announced defensive end Tre Lawson is no longer with the team. Lawson, a redshirt freshman, did not make the trip to IMG. Offensive lineman Cole Minshew did not practice, however Taggart expects him to be ready for the opener.